I’ve drawn many teddy bears over the last twenty-years (I think the actual number was way over a hundred), but some of them mean so much more to me than others. It’s not just to do with the finished illustration, more often it’s the memories created from setting up the drawing, or something significant that happened when working on the final piece of artwork. 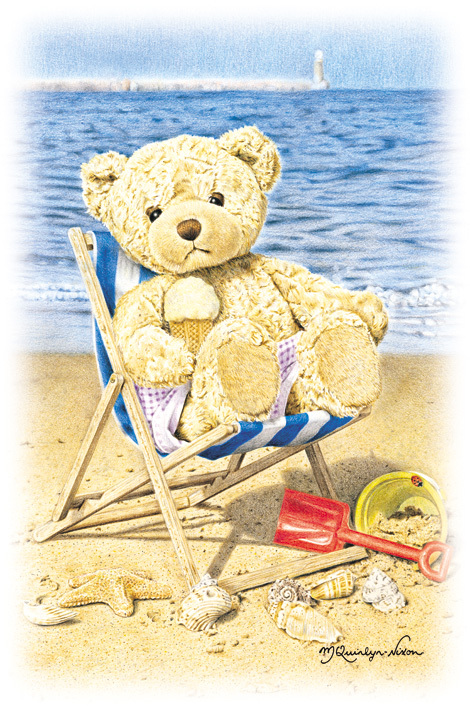 ‘On the Beach’, which was completed on 20 August 2002, is one of my very favourite illustrations from the 2004 Bear-a-thought calendar. I love the bear, which was drawn in the illustration; he is called Augustus. I ‘discovered’ him in a frosted window of a local shop, as I rushed home on a cold winter’s evening after a long day at work. He stopped me in my tracks, to be honest and even though I was cold and tired I had to go and buy him. He has since become one of my most popular teddy bear models, to the point where many customers of my cards and calendars know him by name! This illustration was created from drawings, photographs and sketches done on a beach at South Shields. The weather was lovely and I walked a long way along the beach to find somewhere secluded and private to set up my tableau of bear, deckchair, bucket and spade etc. It never fails to amaze me that no matter how private I try to be when setting up these ‘scenes’, that people seem to come from nowhere and find me. Such was the case on this day; no sooner had I got the little scene arranged, I could see people heading towards me across the dunes, looking a little bit like ants in the distance. Some people skirt around and take an inquisitive glance at what I am doing, whereas other people will come up and say ‘what’s going on with this bear then?’. The latter happened on this occasion, and I met a lovely couple with twin babies, who asked if they could have their photograph taken with the little scene that I had created. They turned out to be customers of mine, which saved a great deal of explanation about what I was doing. Others followed in their wake, and by the time I was ready to do my sketches the tide was nearly upon me! I had to move the whole scene for fear of it being washed away to sea. This drawing also makes me smile because of the special memories and the fact that Augustus is wearing one of the first pair of shorts worn by my niece, Alishia. I also must confess to cheating with the ice cream too, which was in fact a dollop of mashed potato. The seagulls were very interested in that and I had to defend my little scene from being flapped apart by the sound of rampaging wings. So, as you see – being a teddy bear artist is definitely not for the shy or faint-hearted. ‘On the Beach’ is dedicated to the late and great Yootha Joyce, who I had a great admiration for. I later found out that she loved teddy bears (I hadn’t known that at the time), so I hope she would approve of my dedication.